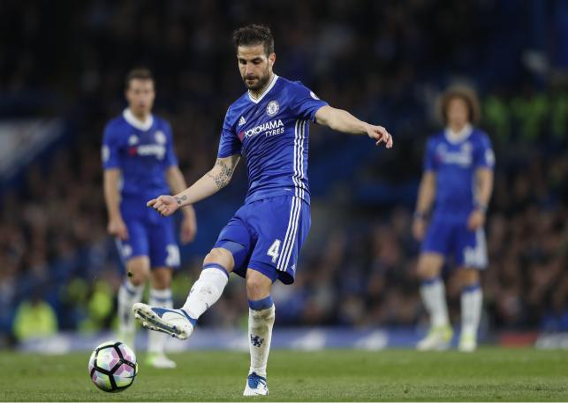 Cesc Fabregas sparkled as Chelsea moved to within touching distance of the Premier League title and condemned Middlesbrough to relegation with a breezy 3-0 home win on Monday. Fabregas made sure Chelsea capitalised on Tottenham Hotspur’s 1-0 defeat at West Ham United on Friday by setting up goals for Diego Costa and Nemanja Matic, with Marcos Alonso also finding the net. It left Chelsea seven points clear of Spurs at the summit and means they will be crowned champions for the second time in three seasons if they win at West Bromwich Albion on Friday. “At this stage it was important to win and exploit Tottenham’s defeat,” said Chelsea manager Antonio Conte. Should Chelsea fail to take maximum points at The Hawthorns, subsequent home games against Watford and relegated Sunderland mean Conte’s side have plenty of margin for error. Fabregas has now assisted 10 or more goals in six different English top-flight seasons—a record in the Premier League era. Boro return to the Championship after one season back among the elite, joining Sunderland in sinking into the second tier just as fellow northeast side Newcastle United are celebrating their return to the top level. “I’ve just come away from a silent dressing room,” Boro manager Steve Agnew told Sky Sports. Chelsea were missing N’Golo Kante—named the Football Writers’ Association Footballer of the Year earlier in the day—due to a thigh injury, but the Frenchman’s absence was to prove a blessing in disguise. It brought Fabregas into the team and the Spaniard immediately set about laying waste to Middlesbrough’s defensive plans with a succession of accurate, strafing passes. He seemed particularly taken by the space behind Boro right back Fabio da Silva. Alonso twice received passes from his countryman in that area in the early stages, seeing a half-volley pushed onto the bar by Boro goalkeeper Brad Guzan and then drilling a dangerous cross across goal. Fabregas side-footed wide from an Eden Hazard cut-back and Costa came within inches of bundling in Hazard’s low cross before the hosts went ahead in the 23rd minute, with Fabregas inevitably the source. Fabio, stretching, managed to get his right foot to the former Barcelona midfielder’s chipped pass, but succeeded only in hooking the ball straight at Costa. The Spain international cushioned the ball and tucked a shot between Guzan’s legs for his 20th goal of the campaign. Chelsea’s second goal, in the 34th minute, sprang from similar circumstances, instigated by Cesar Azpilicueta’s probing pass from the inside-right channel. From a prohibitive angle at the back post, Alonso drilled a shot towards goal and saw the ball ricochet of Guzan’s left thigh and bounce into the net. Fabregas was at it again shortly after with a raking pass that freed Victor Moses, whose shot obliged Guzan to save with his legs. Boro’s bus had been delayed on its way to the ground, but to their dismay, there was little slow-moving traffic to be found inside Stamford Bridge. Chelsea resumed their assault on the visitors’ goal in the second half, Pedro grazing the bar from Hazard’s lay-off and Azpilicueta pinging a shot narrowly over. Costa could only get a couple of studs on a fierce Alonso cross, Gary Cahill almost surprised Guzan with a rasping drive and Fabregas saw a deflected effort bobble agonisingly wide. The third goal arrived 20 minutes into the second period and owed once again to the inventive brilliance of Fabregas. His flicked pass was chested down by Matic, who arrowed a low shot between the legs of the overworked Guzan.